Jo Davidson was born in New York City on 30th March, 1883. He worked under Hermon Atkins MacNeil before moving to Paris to study sculpture at the Ecole des Beaux-Arts in 1907. His realistic busts soon gained him commissions from wealthy patrons such as Gertrude Vanderbilt Whitney. Davidson lived in Greenwich Village where he became a close friend of Lincoln Steffens and other writers and artists. Some of his early commissions included George Bernard Shaw, Woodrow Wilson and Joseph Conrad. During the First World War he made busts of General Ferdinand Foch and Prime Minister Georges Clemenceau. Peter Hartshorn has argued that he attended the Versailles Peace Conference in 1918: "He headed to Paris to take advantage of the historic occasion by making busts of the Allied leaders gathered there. Armed with letters of introduction to French Marshall Ferdinand Foch and Prime Minister Georges Clemenceau, Davidson had high hopes." Over the next few weeks he produced busts of John J. Pershing, Arthur Balfour, Edward House and Bernard Baruch. After the First World War Davidson moved to Paris where he associated with Lincoln Steffens, Ezra Pound, William Christian Bullitt, Louise Bryant, Ella Winter, John Dos Passos, James Joyce, Ernest Hemingway, Ford Madox Ford and Gertrude Stein. According to Justin Kaplan, the author of Lincoln Steffens: A Biography (1974): "Despite their sophistication and internationalism, they belonged to a straggling, authentically native succession of grass-roots radicals (of the right as well of the left) and cracker-barrel sages, men with a populist hunger for drastic solutions and an inclination to spend their time and spirit cussing out the government and the banks while awaiting the arrival of the messiah." Ella Winter was the wife of Lincoln Steffens and they spent a great deal of time with Davidson and his wife Yvonne, a dress designer. In her book, And Not to Yield (1963), she wrote: "We were almost always with Jo and Yvonne. The Davidsons appreciated food in the French manner, and discussed and selected restaurants all over Paris for their specialties. Their thrill at discovering a new bistro, or a sauce at Chez Pierre or Le Commerce, was a curious experience for me, with my London memories of three-and-sixpenny ABC lunches, and I must confess I was at first somewhat dismayed at so much fuss about mere food." Steffens wrote in his memoirs, Autobiography (1931): "Jo Davidson is the only artist I have met who was consciously in the stream of life as I knew it. The others, certainly the young Americans in Paris, had been in the water, some of them had been nearly drowned by the flood of the war, but they saw and felt only the waves that broke over them.... Jo Davidson had been at the front, though only as a correspondent, but he never dwelt on those experiences. Like Jack Reed, he saw and felt the big forces that had done it once to us and might do it again... His art saved the sculptor. Busting generals, statesmen, financiers, he talked to them, and he listened to them, and so saw the war and the peace from the perspective of headquarters, the capitals and the markets... I have heard him say that the war had no influence upon art, only on some of its themes. It had turned him from nudes and decorations to heads, mostly of great men, and he often regretted that." 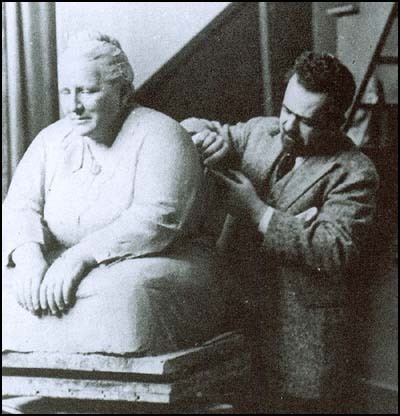 Jo Davidson woerking on a sculpture of Gertrude Stein. Davidson was a political activist and was chairman of the Independent Citizens Committee of Artists, Scientists, and Professionals (ICCASP), a group that supported the policies of President Franklin Roosevelt. An opponent of the Cold War policies of Harry S. Truman, he joined the Progressive Citizens of America (PCA). Other members included Rexford Tugwell, Paul Robeson, W.E.B. Du Bois, Arthur Miller, Dashiell Hammett, Hellen Keller, Thomas Mann, Aaron Copland, Claude Pepper, Eugene O'Neill, Glen H. Taylor, John Abt, Edna Ferber, Thornton Wilder, Carl Van Doren, Fredric March and Gene Kelly. Davidson supported Henry A. Wallace in the 1948 Presidential Election. Wallace's running-mate was Glen H. Taylor, the left-wing senator for Idaho. 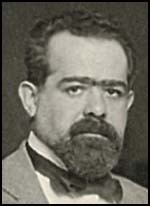 A group of conservatives, including Henry Luce, Clare Booth Luce, Adolf Berle, Lawrence Spivak and Hans von Kaltenborn, sent a cable to Ernest Bevin, the British foreign secretary, that the PCA were only "a small minority of Communists, fellow-travelers and what we call here totalitarian liberals." Winston Churchill agreed and described Wallace and his followers as "crypto-Communists". 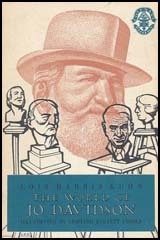 During his lifetime Davidson produced busts of Arthur Conan Doyle, Clarence Darrow, Charlie Chaplin, Lincoln Steffens, Israel Zangwill, Albert Einstein, Emma Goldman, Frank Harris, Hellen Keller, John D. Rockefeller, Dolores Ibárruri, Franklin Roosevelt, Henry A. Wallace, Walt Whitman, W. Averell Harriman, Dwight D. Eisenhower, H. G. Wells, Gertrude Stein, Josip Tito, Carl Sandburg, Edward Willis Scripps, George Bernard Shaw, Mahatma Gandhi, James Joyce, Rudyard Kipling, Robert M. La Follette, D. H. Lawrence, Henry Luce, Andrew Mellon, James Barrie, Joseph Conrad, Charles G. Dawes, Will Rogers, Anatole France, André Gide, Robinson Jeffers, John Marin and Ida Rubinstein. Jo Davidson died on 2nd January, 1952. Jo Davidson is the only artist I have met who was consciously in the stream of life as I knew it. The others, certainly the young Americans in Paris, had been in the water, some of them had been nearly drowned by the flood of the war, but they saw and felt only the waves that broke over them.... Jo Davidson had been at the front, though only as a correspondent, but he never dwelt on those experiences. Like Jack Reed, he saw and felt the big forces that had done it once to us and might do it again... His art saved the sculptor. Busting generals, statesmen, financiers, he talked to them, and he listened to them, and so saw the war and the peace from the perspective of headquarters, the capitals and the markets... I have heard him say that the war had no influence upon art, only on some of its themes. It had turned him from nudes and decorations to heads, mostly of great men, and he often regretted that.